FILE - Chairman and chief executive officer Rex W. Tillerson speaks at a news conference in Dallas, Texas. In Donald Trump's view, ExxonMobil CEO Rex Tillerson’s experience in striking global oil deals is such an asset that the president-elect nominated him as secretary of state. In Asia, analysts said ExxonMobil's deep involvement in developing some fields could complicate his work as America's top diplomat. For years, the U.S. energy giant has been drilling for oil off the coast of Vietnam near the South China Sea, where the offshore reserves are located in a disputed area claimed by both Vietnam and China. Earlier this month a senior ExxonMobil executive received a warm welcome from Vietnamese Deputy Prime Minister Trinh Dinh Dung. Both highlighted the importance of close cooperation in the oil exploration projects in that country. ExxonMobil is also keen to continue developing the Ca Voi Xanh gas field. China had warned foreign energy companies against exploring the disputed South China Sea. “Tillerson will have to assure allies like South Korea and Japan while working to stop potential conflicts, primarily with China and North Korea,” Alex Ward, associate director of the Atlantic Council’s Brent Scowcroft Center on International Security, told VOA Monday. The competition for control of potential energy resources and key energy transit routes through the South China Sea is considered a critical factor heightening the stakes in the maritime disputes. Although the United States is not a claimant to the sovereignty over disputed islands in the South China Sea, Washington said it is vital to its national interests that various claimants pursue their claims peacefully. “America's commercial investment and other economic interests in Southeast Asia depend on America's security presence there,“ said Peter Dutton, director of the China Maritime Studies Institute at the U.S. Naval War College. Dutton advocates for a robust U.S. freedom of navigation operation in the South China Sea. “Maintaining American economic relationships and political influence in the region will be a tall order” that needs the support of traditional allies," Dutton told VOA. About 20 percent of ExxonMobil’s global refining capacity is located in Asia Pacific, including facilities in Australia, China, Singapore and Thailand, according to the company’s 2015 Financial and Operating Review. But Tillerson’s nomination, and his company’s Asian connection, drew mixed reaction from analysts and environmental activists. “Trump has picked staffers on Asia policy that reflect a much tougher line when it comes to China. And Tillerson, whose company drilled in the South China Sea in partnership with Vietnam, which angered China, is clearly a reflection of this shift,” said Harry Kazianis from the Center for the National Interest, a U.S. foreign policy think tank. Nguyen Truong, diplomat-turned-expert on Vietnam-U.S. relations, said Tillerson's selection was as surprising as the election itself. Le Hong Hiep, visiting fellow at the Institute of Southeast Asian Studies-Yusof Ishak Institute in Singapore, said Vietnam is closely monitoring Trump’s foreign policy. Oceana, an advocacy organization for ocean conservation, voiced concerned on Tillerson’s nomination. 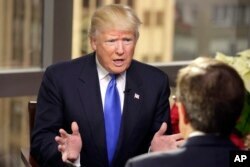 President-elect Donald Trump is interviewed by Chris Wallace of "Fox News Sunday" at Trump Tower in New York, Dec. 10, 2016. Some experts said a policy review might be possible, especially after Trump told Fox News that the United States is not necessarily bound by the “one China policy,” and he broke decades of diplomatic protocol by speaking with Taiwan President Tsai Ingwen earlier in December. "Every new administration there is some kind of policy review on all issues,” Richard Bush, a senior fellow at Brookings Institution, told VOA. The United States recognized Beijing as the sole legal government of China in 1979, acknowledging the Chinese position that there is but one China and Taiwan is part of China. Bush was the chairman and managing director of the American Institute in Taiwan (AIT) from 1997 to 2002. AIT is the mechanism by which the United States conducts substantive relations with Taiwan in the absence of diplomatic relations. “I don’t anticipate a Taiwan Policy Review like 1993-1994, but I’ve been surprised so many times this year that I could be wrong,” Bush told VOA. In 1994, then-President Bill Clinton’s administration did a thorough review and adjustment in its policy toward Taiwan, while still maintaining the one China policy. Some of the policy adjustments include sending high-level officials from U.S. economic and technical agencies to visit Taiwan. Taiwan’s office in the United States also had a new name -- the Taipei Economic and Cultural Representative Office (TECRO). In addition, the U.S. supports Taiwan’s membership in organizations where statehood is not a prerequisite. In New York Wednesday, Trump spoke with Vietnamese Prime Minister Nguyen Xuan Phuc, who congratulated the president-elect and stressed maintaining relations between the two countries, a statement on the government website said. "President-elect Donald Trump spoke highly of Vietnam's recent achievements, the positive developments in bilateral relations and asserted his wish to cooperate with Vietnam to accelerate the relations," the statement said. It also said the two leaders discussed ways to accelerate economic ties, trade and investment.